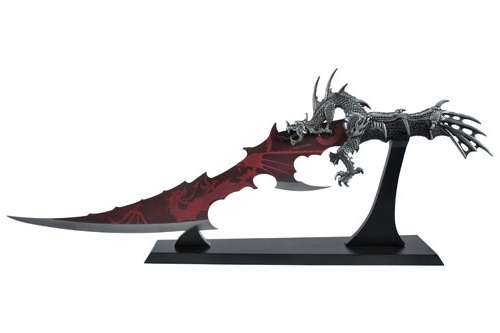 The Rapture red blade dagger with table stand is a must have piece. It is unique with the red inlay blade. This is a pretty big dagger and will be the centerpiece of your collection! This medieval dragon dagger has a 440 steel blade that is adorned with a dragon bodied handle. 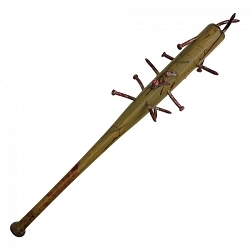 The handle is metal and the bottom portion is wrapped in a firm ABS type material for a sure grip. The knob (end cap) has a sweet fan tail spike that is metal. This comes with a table stand so you can display it after you're done slaying warriors. This dagger is a whopping 27 inches long.